Testificate by the College of Edinburgh in favour of John Gray as being qualified to teach at the `Navigation School', Dunbar. 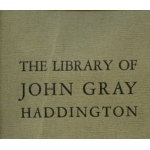 A5 volume describing and listing John Grays library and also includes a biography of John Gray. Written by W Forbes Gray and printed for Haddington Town Council.